Meadows East - Ira M. Emanuel, P.C. 45 unit townhouse development on 4.3 acres. 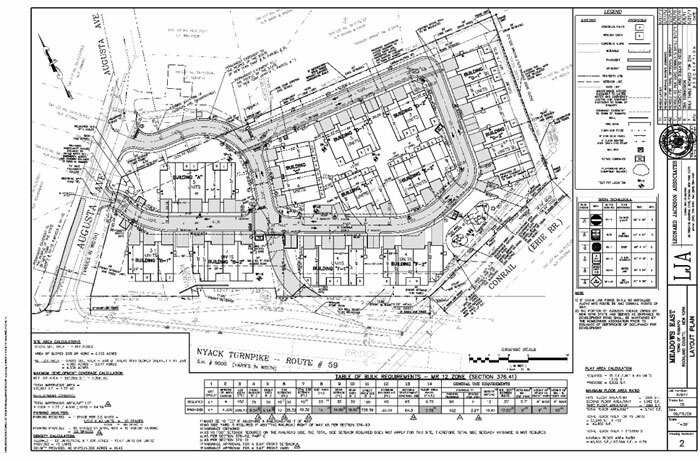 Because of the shape and location of the lot, the Town officials felt that a layout that conformed to zoning requirements was inferior to what could be accomplished if variances were granted. Working with the Town of Ramapo and two separate groups of neighbors, the unit count remained at 45, but internal and external traffic circulation and open space were improved over the conforming plan. A revised site plan was obtained to allow for smaller blocks of units. Approvals include multiple variances and site plan.